The first step in a challenging journey is often the one that means the most. Though it means saying goodbye to the beloved friends and spiritual mentors of her St. Charles, Missouri quilting circle, Anna Goben is certain that she needs to enlist her family in the Boone’s Lick Company wagon train. The loss of her beloved brother in the Civil War has paralyzed her mother and grandfather in a malaise of grief and depression and Anna is convinced that only a fresh start in the Promised Land of California can bring her family back to her. Although the unknown perils of the trail west loom, Anna’s commitment to caring for her loved ones leaves no room for fear—or even loving someone new. During the five-month journey, trail hand Caleb Reger plans to keep a low profile as he watches over the band of travelers. Guarding secrets about his past and avoiding God’s calling on his life, Caleb wants to steer as far from Anna as she does him, but she proves to be just as he assessed her from the beginning— independent, beautiful trouble. Led by a pillar of hope, the group faces rough terrain that begins to take a toll on their spirits. Will the wilderness of suffering lead them astray, or will the gentle song of love that echoes across the prairie turn their hearts toward God’s grace and the promise of a new home? Prairie Song is the first book in Mona Hodgson’s Hearts Seeking Home series. The novel, set in St. Charles, Missouri in 1866, begins a journey across the country with Boone’s Lick Company wagon train. Before you head west, I encourage you to read The Quilted Heart novellas. These prequel novellas introduce you to the diverse cast of characters. After the Civil War, some residents choose to remain in St. Charles. Others bid farewell to their family and friends and head toward the Promised Land of California. Their journey is full of trials and tribulation, but faith and hope keep them moving forward. In Prairie Song, Mona Hodgson paints a vivid picture of life on the prairie. Life on the wagon train is filled with dreams, but also fraught with despair. When fears arise, faith overcomes. The spiritual thread, woven so beautifully into this story, adds to its richness and depth. Being introduced to the characters in the novellas, I felt like I was catching up with old friends as I read Prairie Song. I loved this beautiful, heartfelt novel and look forward to continuing the journey through the Hearts Seeking Home series. Prairie Song is a journey you don’t want to miss! Married forty-one years to her leading man, Mona from Arizona lives in the Southwest where trees have arms instead of branches and salsa is a staple. When Mona Hodgson isn’t writing or speaking, she’s playing Wii games with her Arizona grandson, spending time with her mom, picnicking, texting her sisters, or chatting on Skype with her grandchildren in Africa. 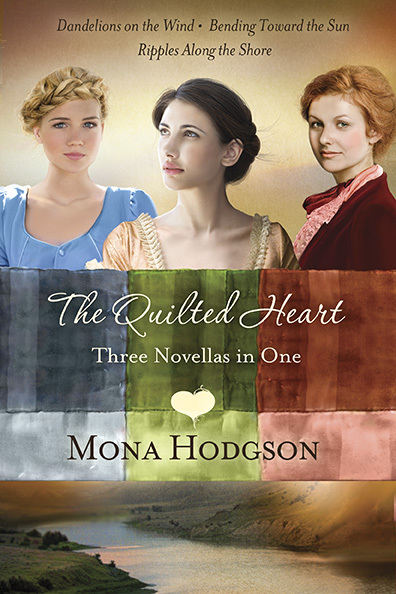 Mona Hodgson is the author of nearly 40 books, historical novels for adults and children’s books, including her popular Sinclair Sisters of Cripple Creek Series, The Quilted Heart novellas, and Hearts Seeking Home Series. Her children’s books include bestseller, Bedtime in the Southwest, six desert and princess Zonderkidz I Can Read books, Real Girls of the Bible: A 31-Day Devotional, and her six I Wonder books. Mona’s writing credits also include several hundred articles, poems and short stories, which have appeared in 50 different publications. Mona is a speaker for women’s groups, Christian women’s retreats, book clubs and reading groups, schools, and conferences for writers and librarians. After reading Mona Hodgson’s Quilted Heart Novellas, I am ready to jump on the wagon train and head west! 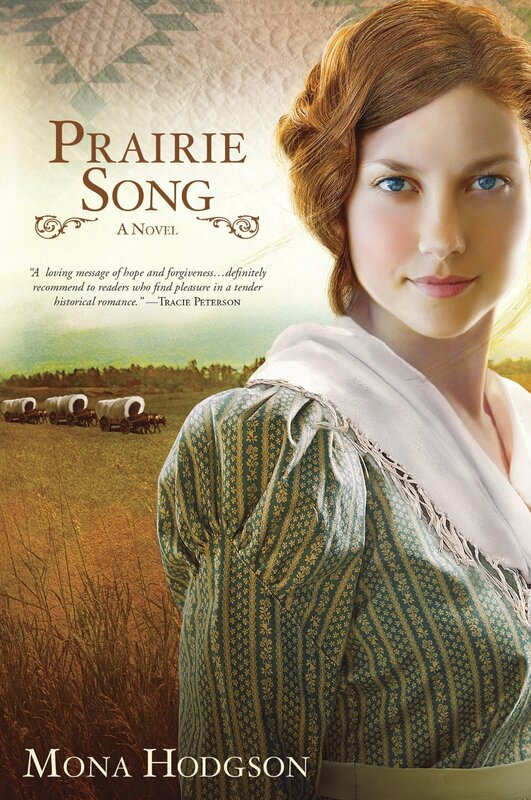 Friday, I will be posting my thoughts about Prairie Song, the first book in the Hearts Seeking Home series. Until then, Mona has a wonderful post on her website I think you will enjoy! Tattered relationships and broken hearts, like a quilt, can be pieced together by God’s love. When Maren Jensen took a job on Elsa Brantenberg’s St. Charles, Missouri farm, she never expected to call the place her home. As she grows to love Mrs. Brantenberg and her granddaughter, Gabi, Maren is transformed from a lonely mail-order bride-without-a-groom to a beloved member of the Brantenberg household. But when Gabi’s father, Rutherford “Wooly” Wainwright, returns to the farm unexpectedly, everything changes for Maren. Despite the failing eyesight that caused her suitor to reject her, she can see that Wooly desperately needs to reconnect with the family he abandoned when his grief sent him running toward the army—and into the Civil War. She also senses there could be something more between the widower and herself, if either can move beyond their past hurts. Comforted and counseled by the wisdom of the women in her beloved quilting circle, Maren begins to discover the cost such decisions demand of her heart. Are her choices in obedience to God, or is she running from His plan? Is it too late for love to be stitched into the fabric of her life? 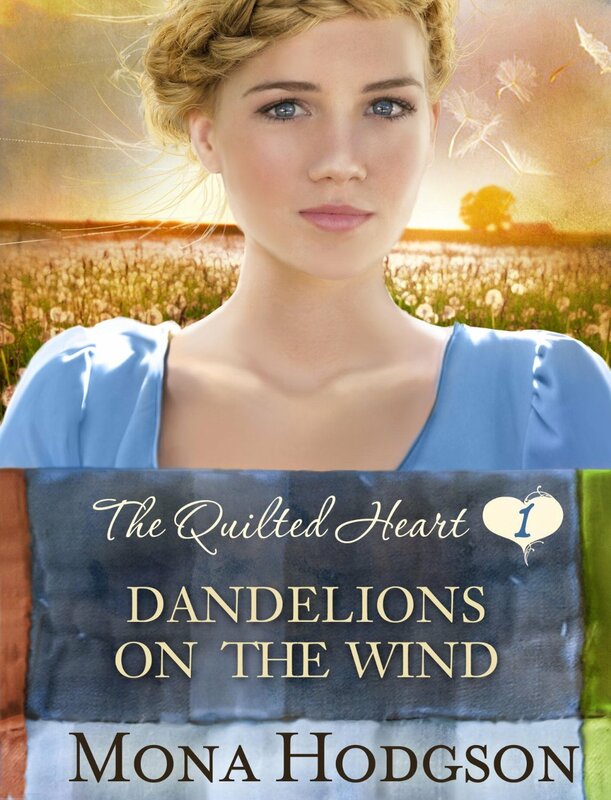 Dandelions On The Wind is the first of three novellas in The Quilted Heart stories. These prequel novellas introduce wonderful characters in Mona Hodgson’s Hearts Seeking Home series. Dandelions On The Wind is a wonderful story of faith and love, told through vivid imagery. Though the years of war have been trying, Mrs. Brantenberg and the members of her household are trying to live each day by faith rather than fear. Find out where their journey leads in Mona’s Hearts Seeking Home series. On January 21, WaterBrook Multnomah will release Dandelions on the Wind, Bending Toward the Sun, and Ripples Along the Shore as a print omnibus–three novellas in one book.